Along with his role in the Black Flag reunion project Flag, Keith Morris also fronts supergroup Off!, featuring Dimitri Coats (Burning Brides), Mario Rubalcaba (Hot Snakes / Rocket From the Crypt/Earthless), and Steven McDonald (Redd Kross). Following their 2012 self-titled release, the next Off! record, Wasted Years, will be out April 8 through Vice. The album cover, above, features art by legendary Black Flag/Sonic Youth cover artist Raymond Pettibon. 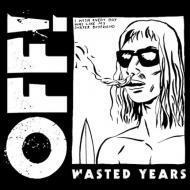 The 16 tracks on Wasted Years were tracked live to tape at OFF's practice space, recorded as they were written. According to a press release, the record has a "thematic darkness".